Cries for spiritual revival and restoration echo across the centuries. That's because over the years we haven't changed much. Our hearts get distracted. Our love grows tepid. We easily wander, stray, rebel, stare God down with a defiant eye: I will live my own way! Then comes the day when we have a change of heart. We want to go back. Is there a way? Yes. 1. God needs to come to us. "Return...visit...revive...restore," begs Asaph. God draws us back to Himself. The desire we have to come back shows He is drawing and tugging. Life is stirring. 2. We also play a part in our own revival. 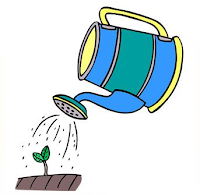 Like a plant needs to take in the water required to perk it up, we need to eat spiritual food and drink spiritual water. That is found in God's life-giving words. We read the Gospels and fall in love with Jesus again. We read the Psalms and feel the pulse of spiritual response. We read the epistles and come away amazed at the depth and breadth of His plan. We memorize so that these life-giving words are always at the top of our minds and the tip of our tongues. We put ourselves "under His shadow," that is, allow Him to work the repentance, healing and restoration that comes with revival. 3. And He breathes life back into us. PRAYER: Dear God, I find myself readily going out to eat and drink. Please revive in me a deep hunger and thirst for You. I want to be like the tree in Psalm 1. Often revivals take the form of mass moves of God where hundreds and thousands of people are impacted in life-changing ways. Read some of the stories of revival from recent history.